The first Australian artist to visit the front during World War I, Will Dyson witnessed the carnage of the 3rd Battle of Ypres in Belgium. Launched on 31 July 1917, over 550 000 Allied and German soldiers were killed in this battle. 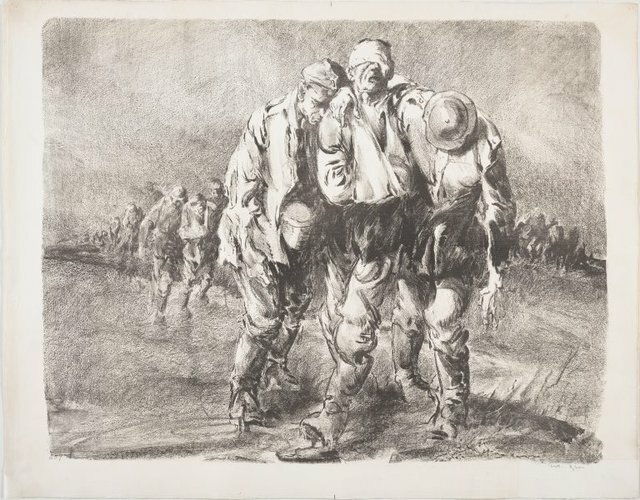 In this poignant and powerful anti-war image, three horrifically wounded German soldiers stumble across the desolate landscape. The central figure, blinded and with a heavily-bandaged arm, is barely supported by his exhausted companions. Unlike much war propaganda designed to fuel public anger by portraying Germans as inhuman and monstrous, Dyson's depiction offers a compassionate vision of the enemy. Signed l.r. corner, pencil "Will. Dyson.". Not dated.